Norway doesn’t have a hockey tradition like its Arctic Circle neighbors Sweden and Finland. It’s still a step behind. But it continues to move up. For instance, its U20 men’s national junior team was promoted to Group A of Division I for the 2019 International Ice Hockey Federation’s World Junior Championship. The Norwegians have been there before. They were promoted in 2013 to the highest level, where they competed in the same division with Sweden, Finland, Switzerland, and Russia, only to be relegated after one year. Norway’s squad was also in Division I Group A in 2017, but was relegated to Group B after winning only once in five games. 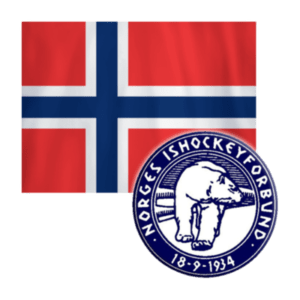 There is no single area that Team Norway needs improve on to stay in Group A beyond 2019. It simply needs to compete at a higher level in all aspects of the game. In winning the Group B gold in 2018, the Norwegians went undefeated, winning three times in regulation and twice in overtime. They scored 18 goals and allowed only five. There was really no flaw to isolate. The goalies, for instance, could have hardly played any better. Jorgen Hanneborg recorded a 1.26 goals-against average and .944 save percentage in three games, while Jonas Wang Wikstol finished with a 0.50 GAA and .971 save percentage. In 11 games this season with the Lillehammer Ice Hockey Club in the GET-Liagen, Norway’s premier hockey league, Hanneborg has posted a 3.03 GAA and a .902 save percentage. Wikstol has played two games this year with the Stavanger Oilers of the GET-Liagen, where he has a 2.50 GAA and .889 save percentage. Both are 1999s and should be minding the nets in the 2019 tournament next month. If Team Norway keeps its goals-against this low, it won’t need to score much. But if offense is needed, Norway will require a performance like the one turned in by 1998 forward Jacob Lundell Noer in the 2018 WJC. He scored four goals and set up six, good for third overall, had a tournament-best +8, and was named his team’s top player. After Noer, offensive output in the 2018 tournament dropped sharply. No one had more than five points. Forward Martin Ellingsen scored four times and recorded one assist while forward Christoffer Karlsen had a pair of goals and added three assists. Still, only eight players had more points than the pair of 1998s in the WJC. Ellingsen has not played in North America, but Karlsen has — eight games in the USHL in 2016-17 split between the Tri-City Storm and Sioux Falls Stampede. This year’s team offensive anchor just might be Morten Skirstad Hodt, a 1999 forward who has three goals and 16 assists in 14 games for Frisk Asker in Norway’s U21 league, and Frisk Asker teammate Sander Hurrod, a 2000 who also has 19 points (10 goals, nine assists). Filip Lalande, a 1999 who scored six goals and set up six in 14 games for Valerenga in Norway’s U21 league. Samuel Solem, six goals, fours assists in 14 games in Sweden’s SuperElit U20 league. And maybe 1999 defenseman Hakon Engh, who in a dozen games with Storhamar in Norway’s U21 league has three goals, six assists, and is a +15. Team Norway will open the 2019 tournament against Belarus on Dec. 9.